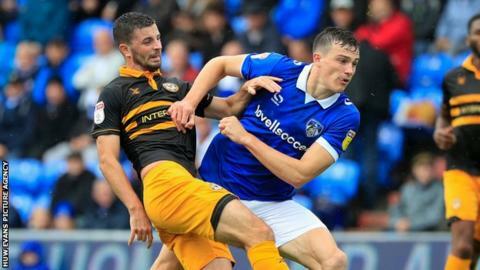 Newport County won their second away game on the bounce as Tyreeq Bakinson's goal was enough to see off Oldham. Bakinson, who is on loan with the Exiles from Bristol City, scored his first goal for County on 69 minutes after being teed up by Matty Dolan. Newport keeper Joe Day made a string of late saves to keep his side ahead as Oldham tried to find an equaliser. The Exiles stay second, behind leaders Lincoln on goal difference, while Oldham drop down to 10th. Match ends, Oldham Athletic 0, Newport County 1. Second Half ends, Oldham Athletic 0, Newport County 1. Attempt saved. Mohammed Maouche (Oldham Athletic) right footed shot from outside the box is saved in the centre of the goal. Jonathan Benteke (Oldham Athletic) wins a free kick on the right wing. Keanu Marsh-Brown (Newport County) wins a free kick on the right wing. Foul by Sam Surridge (Oldham Athletic). Tyreeq Bakinson (Newport County) wins a free kick in the attacking half. Substitution, Oldham Athletic. Jonathan Benteke replaces Johan Branger. Substitution, Oldham Athletic. Mohammed Maouche replaces Christopher Missilou. Andy Taylor (Oldham Athletic) wins a free kick on the left wing. Substitution, Newport County. Mark O'Brien replaces Josh Sheehan. Johan Branger (Oldham Athletic) wins a free kick in the defensive half. Attempt missed. Johan Branger (Oldham Athletic) header from the centre of the box is just a bit too high. Attempt missed. Peter Clarke (Oldham Athletic) header from the centre of the box is too high following a corner. Corner, Oldham Athletic. Conceded by Joe Day. Rob Hunt (Oldham Athletic) wins a free kick in the defensive half. Attempt saved. Christopher Missilou (Oldham Athletic) right footed shot from outside the box is saved in the bottom right corner. Attempt missed. Jose Baxter (Oldham Athletic) header from the right side of the six yard box is just a bit too high. Substitution, Newport County. Keanu Marsh-Brown replaces Jamille Matt. Corner, Oldham Athletic. Conceded by Jamille Matt. Corner, Oldham Athletic. Conceded by David Pipe. Foul by Tyreeq Bakinson (Newport County). Goal! Oldham Athletic 0, Newport County 1. Tyreeq Bakinson (Newport County) left footed shot from the left side of the box to the bottom right corner. Assisted by Dan Butler. David Pipe (Newport County) wins a free kick in the attacking half. Sam Surridge (Oldham Athletic) wins a free kick in the attacking half.